The number of the so-far unexplained honeybee deaths in the US rose at a significant and “troubling” rate last year, according to a government report. The summer deaths have for the first time outnumbered the winter ones. 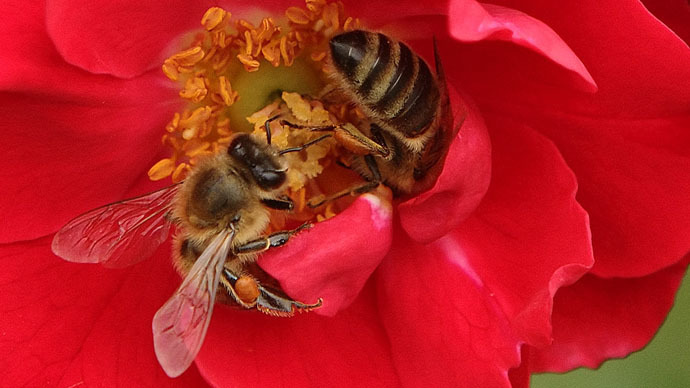 Thousands of beekeepers reported losses of 42.1 percent of their colonies in the 12-month period that ended in April, according to the annualsurveyreleased by the Bee Informed Partnership and largely funded by the US Department of Agriculture (USDA). That number is more than double the 18.7 percent yearly loss that the USDA considers to be economically sustainable. “Such high colony losses in the summer and year-round remain very troubling,” Jeff Pettis, a USDA senior entomologist, said in a statement. The chemical is “extremely safe to bees when used according to the label instructions,” spokesman Dr. Julian Little said, as quoted by the Guardian.